VOL. II NO. 50 REG NO. L5015 DELHI, THURSDAY AUGUST 24, 1944. 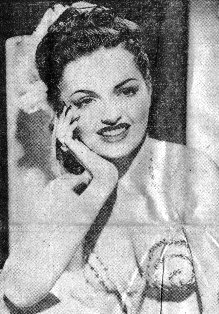 Evelyn Moriarity, a showgal for Earl Carroll in Hollywood, says she likes spinach. Even if she does we don't hold that against her. Breathes there a G.I. with spirit so dead he wouldn't eat spinach with this eyeful? The Allied Armies of America, Britain and Canada, augmented this week by the French in thousands, continued to hack, blast, and bomb the Nazis out of France. The invasion of the north lapped at the gates of Paris and flowed around the historic French capital, as the armored cavalry of an armored cavalryman, Lt. Gen. George S. Patton, performed feats of fast, sweeping maneuver reminiscent of the days and deeds of Jeb Stuart. The invasion of the south proceeded as fast as men and machines could be put ashore, a conglomerate army of Yanks and French, regular and partisan. As the week ended, French troops fought their way into the great seaport of Toulon, while an American column penetrated 50 air miles south of Toulon. Gen. Sir Henry Maitland Wilson's headquarters reported that another American group had joined with the French forces of the interior and captured Toulouse, well west of Marseilles, More than 14,000 German prisoners have been taken. On the Allied left flank, British and Canadians have started a push toward Rouen. Correspondents with the British Second Army said that the German resistance was being crushed under an overwhelming armored attack which was proceeding swiftly against spotty resistance. The falaise pocket has been cut off and is now merely an island within the great north-and-south enveloping wings which threaten to enclose Paris and much of the retreating German Army. Within the Falaise pocket lie an estimated 10,000 German dead. More than 25,000 Nazi prisoners have been taken in the last week and, according to a bulletin received at Allied HQ in the Mediterranean, Patton's men have inflicted 109,575 casualties on the Nazis since Aug. 1. Allied air strength is contributing at every point to the success of the drive to the east. On the Riviera front, practically no air opposition has been encountered. In Brittany, bombers of the AAF and RAF pounded the trapped Nazis until the pocket had reached such narrow width that it was impossible to select targets. The area was left a graveyard of dead and smashed vehicles. An unofficial report from a Spanish source states that a strong American column has passed unresisted through Angouleme, 130 miles south of Nantes on the road to Bordeaux. The American attack on the Toulon beaches is being supported, it was officially announced, by nine aircraft carriers, seven American and two British. The southern invasion has touched off French partisan resistance in great strength. The partisan movement has been prominent in the south and it is now reported that throughout the Haute Savoie, the irregular forces have actually displaced the German Army. An armed uprising in Paris has been reported by the Paris radio, which drew from the German military commander a proclamation declaring a tight curfew and banning civilians access to all potential military zones. Meanwhile, although Paris has not been declared an open city, a Berlin Foreign Office spokesman is quoted as saying: "Paris will be spared military operations just as it was in 1940." 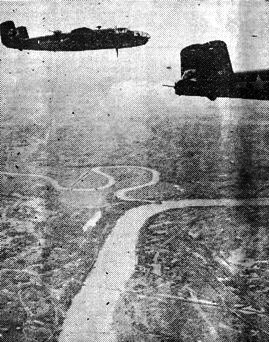 Superforts of the 20th Bomber Command struck a two-ply blow at the Jap mainland this week in a co-ordinated day-and-night raid on the Yawata steel mill area. The initial attack was the first day-time operation against Japan proper since the Doolittle raid of April 18, 1942. Although the targets were not reported in detail, it appeared that the steel mills and coke ovens at Yawata were again the object of the B-29's bombs. The second attack occurred on the night of the same day, when a smaller force of Superforts struck the same targets. Bombing results were reported as good. Four aircraft are missing due to enemy action. Strong fighter opposition was encountered and the anti-aircraft fire ranged from "moderate" to "intense." Twelve enemy fighters were claimed as destroyed, 12 probables and ten damaged. Jap broadcasts said 77 of the huge bombers were over Northern Kyushu island in this fourth raid on Japan proper, and claimed that three had been destroyed by suicide attacks in which Nip fighters rammed the B-29's. He's sweating it out in North India after shooting it out in North Burma. He's Lt. Samuel V. Wilson, of Rice, Va., one of the first of Merrill's Marauders to cross the Burma line, and holder of the Distinguished Service Cross, Silver Star and Bronze Star, all this at the age of 20. He's sweating out after official approval of his selection as a candidate for appointment to the U.S. Military Academy at West Point for the class entering in 1945, and also sweating out a recommendation for promotion to captain. 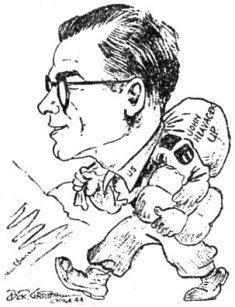 The youthful Infantry lieutenant, survivor of 17 skirmishes with the Japs in one day, has had his share of combat experience and is now ready to resume his civilian status for the West Point appointment, at the end of which he will emerge only a second lieutenant. "If they decide to give it to me, I'll have to take it now, for I'll be over-age in 1945," Wilson said. Col. Charles N. Hunter, now commanding Merrill's Marauders, himself a graduate of West Point, has given Wilson the highest recommendation for appointment as a cadet. If Wilson enters the military academy, it will be the first time the War Department has ever approved appointment of an officer above the grade of second lieutenant. Col. Hunter declares that in large part many of the successes of Merrill's Marauders can be ascribed to the "professional knowledge and leadership" of Wilson. "In my opinion he is one of the most outstanding young officers in the entire Army," Hunter declared in recommending him for one of his awards. Wilson at present is convalescing from simultaneous typhus fever, malaria, and amoebic dysentery, all contracted while in Burma. Wilson considers his closest call came last February when he shot a Jap battalion commander with a carbine. "The patrol I was with had been lost all that day. As we were feeling our way through the jungle, a group of Japs suddenly came up over the bank of a stream and began firing. We hit the ground. One of the Japs headed for a horse grazing nearby, and just as he was vaulting on the horse's back, I shot him and one of the men turned his BAR on the horse. I was busy watching chunks of horse fly into the air and did not see a Jap charge me until the point of his bayonet hit the dust only a foot or two in front of my face. One of my men got him. "I wasn't scared then, but later every time I would think about it, I would get the shakes. We killed five of those Japs at that place and wounded three. In all, we had 17 skirmishes with Japs that day before we got back to the outfit." Wilson earned the DSC in March when he crawled to the Jap lines under heavy fire and directed mortar fire by radio, freeing two platoons from a pin-down, and rescuing two wounded men under withering enemy machine gun and mortar fire. He gained the Silver Star for rescue of wounded men under artillery fire and the Bronze Star south of Shadazup for swimming the swift, deep Hkanglaw Hka River and stealing through a Jap bivouac area to locate Jap supply dumps. Wilson was graduated from Infantry OCS at Ft. Benning, Ga., at the age of 18, and started his military career with the Virginia National Guard in 1940 as a bugler. Troops of the British 36th Division, which recently joined forces with Gen. Joseph W. Stilwell, fought their way slowly towards Bhamo this week and captured the village of Thaikwagon on the Mogaung-Mandalay railroad despite intense heat and torrential rains. In the first 12 days of operations, the 36th advanced more than 12 miles and killed 200 Japs. Although enemy resistance has been comparatively light, the southward drive has been bogged down considerably because of washed-out trails. At times, much of the Allied equipment is being transported by elephants. Following the capture of Thaikwagon, patrols of the 36th have been active north of Pinbaw. In the Kazu valley area, activity has been restricted mostly to patrols by Stilwell's Chinese forces. STRICTLY G.I. By Ehret "THERE WAS A SLIGHT DELAY IN MY ROTATION"
No change in the situation has been reported. 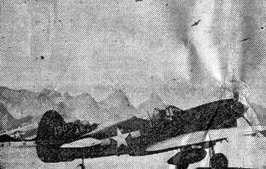 Meanwhile, on the Salween Front, American-trained Chinese units, supported by the 14th Air Force, succeeded in capturing strongly-fortified Jap positions southeast of the Burma Road city of Lungling. Capture of these positions affords the Chinese strategic launching points for the attack on Lungling. Aircraft of Maj. Gen. George E. Stratemeyer's Eastern Air Command this week pounded targets along the northern third of the Mandalay-Myitkyina railroad, furnishing valuable support to Gen. Joseph Stilwell's troops advancing south from Myitkyina. P-40, P-51 and P-47 fighters of the 10th Air Force hit continuously at Pinwe, Pinbaw, Hopin, Taungni and other rail line towns. Mitchell bombers of Maj. Gen. Howard Davidson's force attacked Indaw. In an airfield sweep at Lashio, P-51's damaged six Jap fighters on the ground. 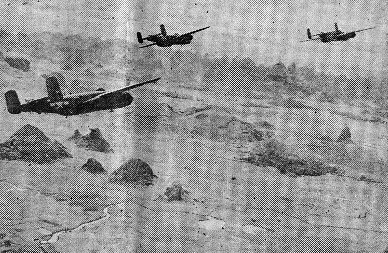 Third Tactical Air Force B-25's were active further south on the railroad, scoring numerous hits on the line between Monywa-Sagaing and Tantabin-Wuntho. They also sank two large river craft at Kedaung and Aingtha, and successfully bombed Monywa. RAF fighters and fighter-bombers gave air support to 14th Army units on the Tiddim road and Chindwin river, striking at Jap positions. Long-range American and RAF fighters struck at communications targets in Central Burma: railroads, river craft and motor traffic. Yamethin Junction was twice attacked. CHUNGKING - The Chinese High Command announced this week that Chinese troops have reached the outskirts of Lieyang and have captured strategic heights west of Hengyang. In the Chinese drive on the Yangtze port of Ichang, three more vital points have been taken. The Japanese made several attacks south of Hengyang, but all were repulsed. 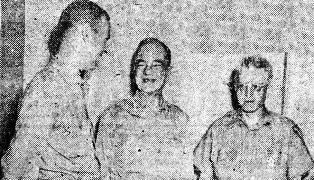 WASHINGTON (UP) - President Roosevelt announced that Donald Nelson and Maj. Gen. Patrick J. Hurley will soon leave on a special mission to China as his personal representatives to Chiang Kai-shek. Roosevelt denied Nelson was being got out of the way because of argument with military heads over reconversion. He said it was a "pressing" mission. The 14th Air Force is currently raising more hell with the Japanese in China than they have since the start of the war. With the new shadow of the Jap lengthening over southeastern China, the Forward Echelon of the 14th has flown more missions in the past four weeks than it did in the last six months. Tired crews and worn planes take off again and again to drop hell from the heavens on the plundering Nip. Two bombers ready to drop their loads on the Japanese. 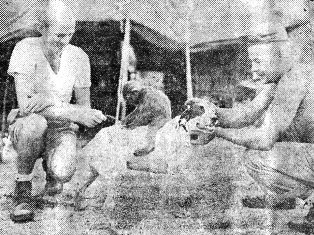 The pictures shown below are first-hand shots of the China boys in action as taken by Bob Bryant, International News Photos cameraman. The pictures that Bryant took are a combination of three missions that he flew with B-25's of Forward Echelon. The B-25's, with their fighter brothers in the P-51's and P-47's, have been bombing Jap installations, troops and ordnance as they attempt to halt the Nip attempt to link up the railroad between North and South China. In a sense, the 14th boys are protecting their own as well as aiding the hard-pressed armies of China. For the Nips are attempting to take over American airfields in conjunction with their railroad drive. Now furnished with the latest models of Mitchell bombers, bristling with .50 caliber machine guns and the deadly 75 mm cannon firing from the airplane's nose, as well as new fighter types incorporating such developments as rocket guns, the 14th Air Force is well-equipped for the job of smashing ground targets from low altitude. Allied air power in China has come a long way from the early days of the AVG, who had only courage and obsolescent P-40's to hurl at the air fleets of the Jap. Today, American and Chinese-American air units range China's skies far and wide, sinking enemy river craft and wrecking their columns. 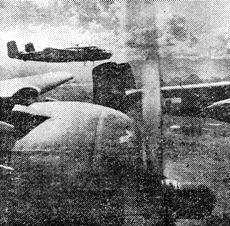 B-25's over Hengyang, with smoke rising from a bombing by the Americans two days before. Brig. Gen. "Casey" Vincent, left, talks it over with Col. "Tex" Hill, ex-AVG pilot. Evasive action is taken by two B-25's to confuse enemy flak and Zeros after dropping their bombs. Returning P-40 pilots "buzz" the field and "peel off" as victory sign. In foreground another P-40. Heavily-armed Mitchells fly wing to wing on way to hit Jap positions. Co-pilot in rear ship looks over at camera. This unusual shot by Bryant shows six bombers all dumping their loads on Jap targets below. The two planes in the foreground look uncomfortably close. In comparison with the size of the planes the bombs are very small, and not all of them will reproduce on newsprint. The Japs discovered they are there. A close-up view of a B-25, bomb bay doors open, as two demolition bombs spin away towards Jap ammunition and supply dumps and troop concentrations below. 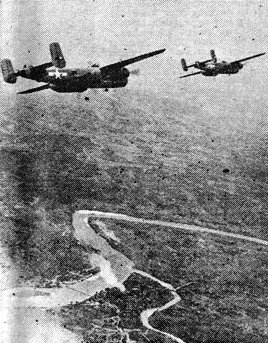 B-25 formation flying over southeastern China en route to bomb the advancing Japanese ground forces. HEADQUARTERS, INDIA-CHINA DIVISION, ATC - The finance section of the Air Transport Command recently transformed the tail end of a DC-3 transport plane into a miniature fianc� office and flew the payrolls to personnel in North Burma in the Myitkyina area. The Americans had nothing to do with their new wealth except buy a few PX supplies which also were flown to the scene in the fianc� ship. So they turned most of the money right back to Lt. John G. Oldfield, the adjutant, and T/Sgt. Robert Glaser, finance clerk, to take back where it came from. Thus the tail end of the plane served not only as a pay table, but also as a bank teller's cage. The ATC fianc� operations have come a long way in carrying the money to the men. Time was when getting paid in the ATC depended upon what luck the bullock carts had in getting through the mud of Assam, or on the whims of termites and the weather - a combination which has been known to lay waster a stack of vouchers a foot high. The story of ATC finances in the CBI Theater is really the story of two GI's who were buck privates together at Wilmington, Del., and their officer, who came overseas with them. They have advanced with the operations they developed - until now the roster shows them as M/Sgt. Edward U. Beach, of Riverside, Conn.; WO (jg) George R. Olsen, New York City, and Maj. George H. Groff, Millersville, Pa. The latter, now India-China Division, ATC, fianc� officer, was a first lieutenant at Wilmington. 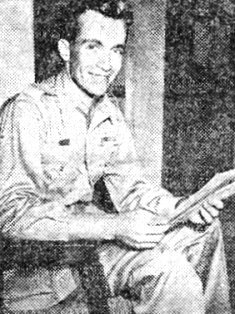 Back in April, 1943, Beach and Olsen and Delbert Carmichael, than a lieutenant and now a captain, composed the only ATC finance office in the theater, with the exception of Groff's administrative wing finance chair. The men were responsible for everything that went on in the office - from development of procedures to mechanics of making out vouchers. Since Beach and Olsen opened the original office the amount of money handled monthly has increased 1,530 percent; the number of vouchers, 1,780 percent. Finance personnel has risen from the original two enlisted men and one officer (in addition to Groff at wing headquarters) to 54 men, 12 officers and four civilian typists. Olsen, Beach and Groff now are together - at division headquarters. Other personnel in the headquarters which once had only one officer, included Capt. John M. Evans, Wilkes-Barre, pa., S/Sgt. Anthony Sliwka, Hollywood, Calif., and Cpl. Edward Disman, Sheboygan, Wis.
"We want to see that Uncle Joe is done right by." That was the explanation members of a troop carrier squadron gave for a letter to the Roundup this week, wherein they assert that Gen. Joseph W. Stilwell was the victim of false information recently when he paid off a bet to Brig. Gen. Lewis A. Pick. The bet in question was whether a 6x6 truck or a cargo plane would be the first to reach the Hukawng Valley. Stilwell bet on a plane. Pick bet on a truck. According to first reports received by the Roundup, a 6x6, driven by Cpls. Adis Crawford and Percy Lewis, pulled into the Hukawng airstrip on Dec. 26, and Uncle Joe promptly paid off. But now the "Biscuit Bombers," as the troop carriers call themselves, declare, in effect, that Uncle Joe has been fleeced. The "Biscuit Bombers" claim they were the first to reach the Hukawng, and as proof, they send along a true exact copy of a flying form, showing that a C-53, piloted by Lts. J. A. Loomis and J. W. Ballard, with Sgt. C. Carlton as crew chief and Sgt. R. L. Castaline as radio operator, landed at the airstrip on Christmas Day, one day earlier than Pick's truck. Definitely a case for the chaplain. Rotation, recreation and reading matter may be slow on the go in reaching this Theater, but in at least one department CBI has a valid claim for a speed record. An Army Times squib from the Alaska Defense Command tells in detail how it takes 10 months for a snowboard soldier to get the complete brush-off treatment from the gal back home. Shucks, in the Air Corps we call that "slow-timing." The first-month four-page mash notes, filled with "Dearest" and "Forever Yours," soon fall off to details of how busy she is, relates this G.I. summary. In the fifth and sixth months, letters close abruptly. In the seventh month, a furlough (no kiddin') renews the romance, but before long those letters to "Dear Jim" just crawl in, significantly closing with "Sincerely." At the end of month No. 10, you get the square white envelope. "Mr. and Mrs. Blank announce, etc. ", plus the few personal lines of explanation to ease the shock. That's rough, Alaskans, but gradual. Out here mail is so slow the babes figure it's best to hit you with an axe right away: six to eight months is average brush-off time, but we've got lots of sub-par shooters. Course we don't have to mess around with old furloughs which just delay the inevitable. The "Sudden Death" or "Bolt-from-the-Blue" brush is famous in CBI. Our real classic was the delayed action model one Sgt. received. "Dearest Joe. I got married last month - don't know why I did it, as I still love you." Tie that, anybody. HQS. - China Air Service Area Command: The old assumption that you are "getting out of the Army" when you are shipped over the Hump to China is a thing of the past. In the not so distant past soldiers were led to believe that once they got to China such minor things as uniform regulations, salutes, etc., were packed away with your summer flannels and dinner clothes. Not so any longer. Col. Clarence P. Talbot, commanding the China Air Service Area Command has informed his troops that they will (repeat) will pay strict attention to uniform regulations; that they will (repeat) will salute officers in a snappy and military manner and that they will in all ways conduct themselves in a manner becoming a soldier of the United states Army. It's been a little tough on some of the old timers, but they are quickly falling into the practice. And many an old "China hand" officer is surprised when he is saluted on the age-old streets of China. HQS., SEVENTH BOMB GP. - The first members of the Seventh Bombardment Group to walk out of China are back with the Eager Beaver Squadron after 10 days in a mountain village of Western China. KILLED Tom Treanor, 36, war correspondent for NBC and the Los Angeles Times, has been killed in the Allied march on Paris, NBC disclosed Monday. Treanor was first accredited as a correspondent in CBI and spent almost a year in this Theater. Without accreditation, he covered the battle of El Alamein with assault troops. Later he reported the Sicily and Italian campaigns and landed with the first troops in Normandy. His widow and three children survive. crew recently forced down in Old Cathay when one of their engines caught fire as they tried to cross the Hump into India. The story they told their buddies on the return was not one of insurmountable hardships, dodging Japs and unfriendly natives in savage jungles, but one of pleasant, curious, obscure Chinese villagers, who knocked themselves out trying to make the American fliers more comfortable. "But that doesn't mean the fleas in the beds didn't bite the hell out of us," declared Burgdorf, the co-pilot, as he ruefully scratched a couple of red whelts on his torso. Nor was everything as "ting hao" as the American way of life. 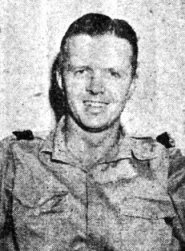 The men were saddened by the death of their pilot, Lt. William J. Brenner, who died at the controls trying to give his men a chance to bail out. Later, the fliers found the wrecked plane and buried Brenner. After parachuting to safety, the men were taken by Chinese farmers to a native village where they spent the night. The villagers fed them well, exhibited great curiosity and friendliness, gave them all haircuts and shaves, but none of the Chinese could speak English. A prisoner was finally brought in who knew a little English, but the fliers refused to talk with him after finding out he was suspected of being an enemy sympathizer. During their march back to India, the crew visited a number of villages, finding the same friendliness everywhere. The wandering Yanks were particularly impressed by the fact that the Chinese refused to take payment for any courtesies. However, at one village, the magistrate, suffering with skin sores, did permit himself to be treated by the fliers. After four days on mule back - and always with a convoy of Chinese soldiers and peasants - the men finally reached a village, headed by an American missionary-trained doctor, where they were soon met by a U.S. medical officer. They returned with the officer to an undisclosed airfield and were flown back to India. HQS., 14TH AIR FORCE, CHINA - This is a reversal of form, bites dog, or whatever you wish to call it. In short, it is a tale in which an officer of Maj. Gen. C. L. Chennault's 14th eulogizes the exploits of an American newspaper war correspondent, instead of vice versa. 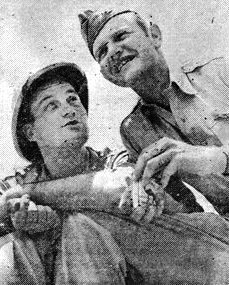 It is the story of the heroism and sacrifice of John Hlavacek, youthful representative of United Press in China, as told by Lt. James J. Janasky of Shamokin, Pa., an eye-witness of Hlavacek's "swell job" during the evacuation of Hengyang airfield under the very guns of the Japanese invaders. Hlavacek, whose parents, Mr. and Mrs. Frank Hlavacek, live at 426 No. Catherine Avenue, LaGrange, Ill., has been a United Press correspondent for the past eight months. He came to China in 1939 on a fellowship from Carleton College, Northfield, Minn., to teach English at the Carleton-in-China school at Fenchowshanshi. He taught there for two years and then for a year drove International Red Cross trucks of medical supplies to hospitals throughout China. He next worked in the office of the American military attach� at Chungking until joining UP's foreign staff. He reads, writes and speaks Chinese. To get back to the main story, with Lt. Janasky taking over. "We were on duty at the airfield at Hengyang," related Janasky. "We knew it was a matter of hours before the Japs would be in. Our job was to get all the moveable material out as quickly as possible and to destroy the airfield when we had completed that job. "Besides myself, there were five officers, several enlisted men and young Hlavacek. Everybody else had evacuated. But fast! Hlavacek, we call him Johnny, could have gone too, but he preferred to stay, not only to get the story but because he admired the fighting courage of the Chinese. "Johnny had lived with them and taught them. He liked their innate good humor and their ability to take it. This was June 20 and there weren't many coolies left on the field to do the heavy work. Those that were left were Johnny's friends. He talked to them, kidded them and told them funny stories in Chinese. They loved him. So did all of us. "We were sitting around the vacated mess hall, having a bull session. The Nips were getting closer and closer. We had no orders to evacuate or destroy yet, but we knew they were coming. Early on June 21 orders came through from Gen. Vincent's headquarters to pack up and then blow up what was left. We hadn't much help so Johnny made the suggestion we all pitch in, regardless of rank or station. "Johnny is a slight chap, none too muscular, but it was really something to see him swinging frag bombs, gasoline drums, supplies and everything moveable onto the flat cars at the railroad station. He worked as hard, if not harder than any of us. His hands were a mass of cuts, looked like raw beef. And all the time he kept kidding the Chinese along in their own language, directing their efforts and getting about 500% more out of them than we ever could have gotten. Getting a 'story' wasn't on his mind now. "We worked ceaselessly from noon until midnight; after that there were no more cars coming in. We stopped and had our first food, some cold C rations and biscuits. With the cars finally loaded, we all returned to the field to plant 20 1,000-pound bombs to demolish the airport. Johnny aided in getting the bombs out of the trailers, still keeping up his running patter of Chinese to the few remaining coolies. We knew danger was getting closer all the time. "At 5 a.m. the work was done. So were we. We waited until daylight to burn the buildings and set the fuses. At 4 a.m. the buildings were fired. "Then we heard planes. We dove for our slit trenches. But they turned out to be our own. The bombs were fused with long lines. We lit them and didn't wait. We piled into our four jeeps and a trailer and hit for a nearby town. There the troops, too, were preparing to evacuate, but we didn't care. We were all in ... we stayed there all night and then proceeded on to an American base. "I think and so does every other soldier on that field, that Johnny Hlavacek was the most powerful factor of that evacuation. We couldn't have done much without him, his hard work, his disregard for personal safety and his knowledge of Chinese were invaluable. I would say that without Hlavacek we would have been lost." "It has come to my attention that you were of great assistance to the officers and men of the 14th A.F. during the recent evacuation of Hengyang. "According to my information, you stepped far beyond the duties of a civilian war correspondent and exerted your physical efforts in a manner extremely helpful to the troops in that area. I have been told that you were one of the last to leave the city and, that up until the final moment of your departure, you aided in loading valuable equipment, and thenassisted in burning and blowing up such equipment as could not be moved. In addition, your knowledge of the Chinese language was most helpful. "Your efforts are warmly appreciated." An additional letter of commendation was sent by Brig. Gen. Clinton D. (Casey) Vincent. CHINA AIR BASE - Saved - one minute: every dime a Chinese had saved for two years - the next five minutes: his life. That is what M/Sgt. James W. Burk of San Antonio, Tex., did for a humble Chinese houseboy here recently. The members of Burk's squadron were sitting at their local movie palace, Grauman's G.I. Chinese Theater, when someone at the end of reel two yelled "fire!" Response to this were cries of "Aw, shed ap!" as there had been jokers in the audience before. But the man who yelled "fire" meant it. The hostel barracks 50 yards away was ablaze. 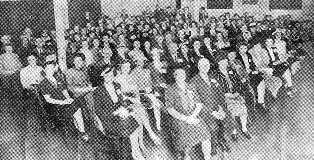 The recreation hall was evacuated quickly, the audience rushing to the flaming scene. Burk, who used to work for the San Antonio fire department, and whose military career at Kelly Field entailed fire safety inspections, operation of a crash truck and clerking for the fire chief, took charge. There was only time to save a few things. Burk knew that his houseboy had been saving his money for almost two years and that he had about $24,000 (Chinese) in his room (about $130 American money) and he knew where the money was. On emerging from the smoke and flames of the barracks, Burk found his bucket brigade had not done so well. His Chinese houseboy had arrived, was carrying water to help extinguish the flames when he became entangled in a falling live wire. Burk picked up the boy and for 25 minutes gave artificial respiration. Came a slight pulse, a groan, and the houseboy was again conscious. The houseboy, when well enough to be interviewed, was reached for a statement. "Sgt. Burk," said he, "ding how!" STILWELL'S HEADQUARTERS, NORTH BURMA - High on a hill in the North Burma bamboo sits the fanciest cook in all Burma, probably the only Army cook in military history who ever pulled a general's rank on an M.P. That cook, who can do more with a can of corned willie than your mother could do with a turkey, is Sgt. Jules (Gus) Reynaud, 33, former chief chef at New York's Stork Club, the Waldorf-Astoria and the Larchmont Yacht Club, once a member of the French Army Medical Corps and now chief and only chef to Gen. Joseph W. Stilwell. It was Stilwell's rank with which Reynaud once played loose. Reynaud was going down a muddy road in a truck, heading for the quartermaster depot to pick up food for the general's kitchen. Traffic was being held up for some reason or another by a military policeman and Reynaud got out of his truck and explained - in some detail and with emphasis - the nature of his mission. There was considerable exchange of opinion, but Reynaud didn't get down the road until the M.P. said he could go. Later on the General mentioned the matter casually to Reynaud. "I wish," he said, "you'd quit pulling my rank." Gus spends his spare time reading the Broadway gossip columns from the New York Daily News, following, with a considerable degree of objectivity, the careers of some of the Broadway characters who used to be his customers. His wife, who lives in Jackson Heights, clips the columns and sends them to him in the mail. Gus likes to cook for General Stilwell, except sometimes Gus worries because "he eats like the birds." "Most of the time all he eats for dinner is a couple of pieces of raisin bread (which Gus makes especially for the General) some butter and jam and a cup of coffee." Gus has been cooking for the general for about three months now. "But," he says, in his buzzing French accent, "I am still a sergeant." HQS., TENTH AIR FORCE - Flight Surgeon Capt. Peter Commings, presently assigned to "Earthquakers" Bomb Group of the Eastern Air Command, might well be called "an international physician" as he has treated ailing natives of five different countries. During the past 15 months of overseas service, Commings has been called upon to treat patients in Libya, Tunisia, Sicily and Italy, and is now handling the "sick book" for hundreds of Indians, plus regular squadron duties. As the doctor put it, "There are patients everywhere in the world, but every time I work up a good clientele, the Army moves me on to another country, and I have to leave them behind." 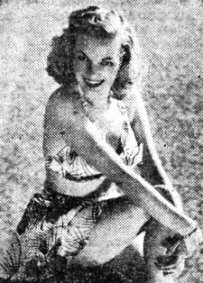 THE BRIDE Comes Saturday and Elyse Knox, screen beauty, will be the wife of ex-CBI pilot Lt. Tommy Harmon. They will be married at Ann Arbor. WITH THE CHINESE EXPEDITIONARY FORCE AT TENGCHUNG, SALWEEN RIVER FRONT - In the Tengchung Valley - first large community in China liberated from the Japanese - the enemy has been ruthless to the point where Chinese farmers, conscripted to build fortifications, were shot in groups when the defense works were finished to prevent them from escaping and possibly giving information to the Chinese Army. But the Japanese during their more than two years of occupation have also been calculating and at times far-sighted in their dealings with the local peoples of this once one of the world's greatest jade markets and largest trade center between China and Burma. In the Chinese version of a town hall, wherefrom groups of coolies were continually being dispatched to the various Chinese divisions to carry wounded and ammunition, a bearded old magistrate and his associates told me of their sufferings under enemy rule. When the Japanese forces entered Tengchung on May 10, 1942, the majority of the villagers fled to the hills. Sometimes at night the men sneaked back down into the valley and brought up food. One day in all the market places the enemy posted notices: All houses found empty two weeks hence would be burned. A few of the women remained behind in the mountains, but the rest had to return or lose all. To each village headman the Japanese authorities gave a list of the number of workmen and the amounts of rice, pork, beef and vegetables that must be delivered to their depots. Several villages failed to produce the demanded quota and Japanese soldiers searched the houses and took everything they found. When the Japanese Army first arrived, the magistrates said, enemy soldiers in groups of three or four up to 40 or 50 had come into their villages and taken their women. In the small village of Huang Po a drunken Japanese corporal one evening killed a young woman and her child. After six months of enemy occupation a Japanese political director arrived and the soldiers no longer molested their women, though they were required to furnish larger and larger numbers of laborers for the building of enemy fortifications and rooms. peasants who tried to escape from the labor gangs were shot. After a contingent of the Japanese Army's Korean prostitutes was shipped in the soldiers did most of their celebrating in their barracks area. The Japanese repeatedly told the peasants that the hundreds of planes they heard and saw flying overhead were theirs. When the drive by American trained and supplied Chinese troops began on the Salween River, the Japanese laughed and told the local people the Chinese Armies would never be able to cross the 11,000-foot Kaeli Mountains. As the Chinese Armies pushed closer, the Japanese sent soldiers around with new and larger lists of supplies and food to be supplied by the local villagers. 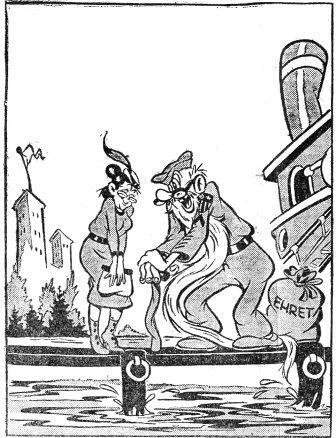 "The enemy never received the last 12,000 pounds of rice they demanded from my village," the stately old magistrate said with a smile as he got to his feet and made a short bow of farewell. "Several times a day the Japanese soldiers came to my place with angry notes demanding immediate delivery. Each time there was some reason why we couldn't deliver until tomorrow. Now we have sold the rice to the Chinese division that has its headquarters in our village." MONKEY BUSINESS M/Sgt. Dexter C. McGee and S/Sgt. Dale L. Stouffer watch "Pfc. Oscar" try to figure out how to ride "M/Sgt. 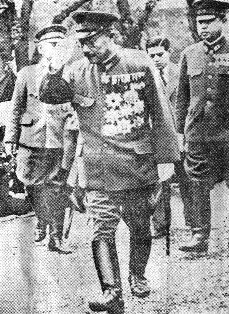 Chico" at their Northern Burma base. McGee bought "Oscar" for a piece of candy. MYITKYINA, BURMA - Amidst bullets buzzing and Zeros zipping, the Signal Corps team had been busy digging in. Soon they were safely settled in their dugouts, sandbags hovering around like a protecting cloak. Then the big, impressive aerial was erected, the power generators tuned up and the expensive, multi-dialed receiver installed. Broad smiles broke out as first contact was made with other Signal stations. But alas, impatient G.I. 's, impressed by the sizable radio installation, wondered what was happening in the outside world. How was the war going? 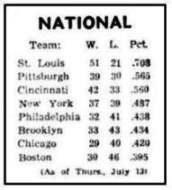 Who was leading the national League? With such a big radio it should be easy to get all the news. Sgt. Tommy Lambert twisted dials and pushed buttons, but only squawks emanated from the speaker. Frustrated, he invariably came up with "Nothing's happening, anyway." Toward evening a soldier approached wearing "a cat that ate the canary expression." "Didya hear the news, fellows," he proudly queried. And told of the attempted assassination of Hitler, the Russian advance to the Prussian border, the storming of Guam, new drives in Normandy and a few other breath-taking accounts. "Where did you hear it?" we inquired, "Oh, I've got a little two-bit battery radio that brings in all the news," he stated and ambled off. HQ. 14TH A.F., CHINA - One of the most important branches of Gen. Claire L. Chennault's 14th Air Force is an entirely unpublicized one, the Chinese warning net. This is made up of friendly natives, all over the land, who spot approaching enemy aircraft and, through a sort of "tom-tom" signal system, relay the information to the Flying Tiger outposts. When the first photo Recon P-38 Lightnings arrived in China, late in 1942, they created quite a bit of excitement. The first ones were flown by the late Maj. Frank Schiel, former AVG, Maj. dale Schwartz and the late Maj. John W. Robinson. The Chinese had never before seen such an airplane and it was quite a chore for them to identify it properly. But one aged Chinese figured it out. He sent out the word: "When you see a friendly airplane that looks like two P-40's tied together... that's a P-38 Lightning." The description stands to this day. HERE'S THE CBI CLUB OF ST. LOUIS Relatives, girl friends and well-wishers of G.I. 's in the CBI have formed a club in St. Louis. Look them over and see if you recognize anyone. 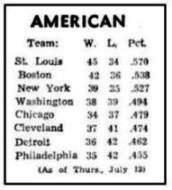 Maybe we're gone but we're not forgotten, at least as far as St. Louis is concerned. ASSAM REST CAMP - With all the defenders of Myitkyina now good little Japs, members of a Combat Engineer Battalion, now recuperating at rest camp, can recall the days when the emphasis was on "combat" instead of "engineer." Several weeks ago they were lusty, hard-muscled G.I. 's building bridges and maintaining the Ledo Road, digging, filling, and scraping the red Burmese mud after floods and monsoon storms. Suddenly, fate dealt them a new deal, and the winged across the Naga Hills in transport planes to land at the Myitkyina airfield taken by Merrill's Marauders. The word "combat" in their outfit suddenly took on a new significance, they tell you today. Instead of shovels, they now wielded guns. The Japs, convincingly announced by well-placed artillery fire, were a few hundred yards ahead. Here a guy had to function as an Engineer and defend himself as well. S/Sgt. Lester E. Shockley, of Atchinson, Kans., construction Engineer, was now a platoon sergeant. Besides supervising the work of his men, he was responsible for seeing that they remained alive. For three days, his platoon was marooned in the fork of the Y between the field and the city proper. When the Japs pulled in reinforcements to blast them from their positions, the Engineers took advantage of heavy rains, calmly walked unscathed through the Jap lines to rejoin their outfit. Pvt. Edward M. Korimsak owned a pleasant little farm outside of Langhorne, Pa., before shipping overseas. He was surprised to find himself helping throw up a road block north of Myitkyina's railroad station. Three nights later, a lone Jap charged the slit-trench where he stood, watchful. Korimsak's overheated rifle jammed. He yanked the pin from a grenade, threw it. A moment later it landed at his feet. The Jap was playing catch. Then Hell broke loose. Three times during the endless night, Korimsak roused. There was an agony in his toes. A grotesque shadow was firing into the trench. Miraculously, the bullets missed him. Morning came, and he heard Brooklyn accents overhead. The Americans had regained the ground lost during the night. The same day, Korimsak was flown back to India where his injured foot was mended at one of the modern hospitals established by Brig. Gen. Lewis A. Pick's service troops. Pfc. Lee B. Chapman once drove trucks in Hurricane, W.Va. He was at Myitkyina 22 days, all told, has a couple of shrapnel scars as souvenirs of his stay. And there are Pvts. Alfred M. Pryor, of Bethpage, Tenn., and Buckner L. Pierce, of Campbellsville, Ky., two other farmers who learned to handle a gun as well as a hoe. Combat Engineers with a vengeance. Here is a bandaged arm, there a foot in a plaster cast. Minor flesh wounds from shrapnel fragments are fast mending. But these boys aren't kicking. They did their job, did it well. They're modest about it. Ask Pierce how many Japs he killed, "Don't rightly know," he'll tell you. "We were shooting so thick and fast, never could figure where the bullets fell. And if a Jap conked over, never knew who got him. All we cared was - he was dead!" CHINA - Chaplain Albert J. Buckley of the 14th AF was recently awarded the Soldier's Medal for heroism after assisting in the rescue of a crew from a wrecked and burning plane. Fuses on delayed action bombs were in danger of going off and the rescuers worked under conditions of extreme danger. The Chaplain is now attached to a fighter group that has been in action in China for more than two years. He comes originally from Chicago and his last duty in the States before entering the Chaplains' Corps was at St. Hugh's parish in Lyins, Ill. Bombers and fighters of Maj. Gen. C. L. Chennault's sky forces were in "business as usual" this week, hammering the Japanese war machine in every department, but concentrating on shipping and strategic bridges. 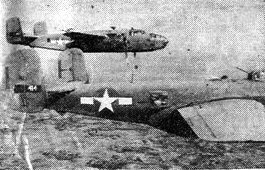 Outstanding feat was the sinking of a Jap cruiser in the South China Sea by a lone B-24. Liberators also got a 5,600-ton freighter and another of 4,000 tons on sea sweeps in this area, plus three more enemy merchantmen in the Formosa Straits. Takao harbor on Formosa was twice raided by the big bombers, which also struck for the first time at the vital Mako naval base in the Pescadores islands, 400 miles north of the Philippines. P-40's gave Yangtze river traffic a continuous working over: they sank a 200-foot cargo steamer and set four others afire in one mission, destroyed or damaged dozens of steamers, junks, launches and small supply craft in other attacks. P-51's probably sank a 350-foot steamer on the Siang river. Other P-40's, sweeping the Red River in French Indo-China, sank a 150-foot steamer and left nine others burning or damaged in two missions. They also attacked eight large junks off the Luichow peninsula, sinking six. All week long, B-25's, P-51's and P-40's in the Hengyang area blasted out railway, highway and pontoon bridges to tie up the Jap armies there. Two road sweeps by fighters in the battle area resulted in 275 enemy troops and over 200 horses killed, besides the destruction of numerous trucks and damage to Jap tanks. Japanese fighters were less in evidence than usual, but two flights of Zeros intercepted 14th Air Force planes attacking Salween front targets in support of the Chinese ground offensive. This was the first air opposition met in this area in many weeks. Seventeen Nip planes were destroyed during the week, while from all missions flown, 14 U.S. planes are missing. 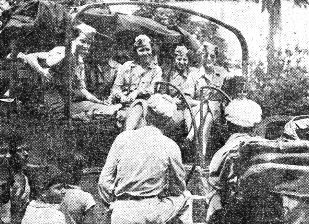 WACS WELCOMED TO CBI THEATER The first WAC detachment to serve with the Army Air Forces in the CBI Theater is shown here just before debarking from a truck for a shopping tour of Calcutta. The girls weren't identified so they will just have to recognize themselves. On hand, of course, are the usual bunch of Indian curiosity wallahs. The PROS would have us believe the gals took one look at India and said, "Foreign service is wonderful." CHINA AIR BASE - In one of the most daring individual attacks of the war, a B-24 of the 14th Air Force early this week sank a Japanese cruiser of 14,000 tons in the South China Sea. Three separate bomb runs were required to finish off the enemy warship, which was spotted shortly after midnight by bombardier Lt. John D. Shytle after the big Liberator had scoured the seas seven hours in search of a target. 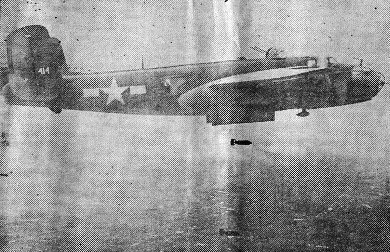 On the first run, three bombs were dropped from a very low altitude, scoring two direct hits, after which the plane broke away to the left. The second attack, 30 minutes later, produced another direct hit and a near miss, stopping the fast-moving vessel in the water. Again the B-24 made a left-hand breakaway. "We were a little leery of a third run by this time," reported Shytle, who is already credited with 51,000 tons of shipping in six missions. "We realized this was something really tough, so we held a hurried conference in which every member of the crew participated." "She sure is hard to sink," said radioman T/Sgt. Harry Niess, "Let's go after her again." Lt. William McCaffrey, co-pilot, clinched the decision: "Hell, we can't pass up a chance to sink one of Tokyo's navy, can we?" Once again pilot Lt. Jay E, Levan swung his charge in to attack, meeting a barrage of flak and tracers, but Shytle registered another hit and a near miss. This time Levan, at his co-pilot's request, broke off to the right, just as the ship's gunners unloosed a terrific blast of fire at the point where the plane would have been on the usual lefthand turn away. When the B-24 returned soon after, the ship had disappeared, an hour and 50 minutes after the first attack. Praising the feat, Col. William Fisher, group commander, revealed that this same crew, except for the pilot, sank the former Italian liner Conte Verdi at Shanghai August 9, and destroyed three Jap freighters single-handed on August 13 in a South China Sea sweep. Other crew members are Lt. Lee Cunningham, navigator, S/Sgts. Edward Olom and Thomas Murphy, radiomen, Sgts. Bruce Ludwig, Norman Lareau and Lawrence Bowar, gunners, and T/Sgt. Charles Hemsley, engineer. The Liberator itself has no name, and in fact does not even belong to their squadron, the boys said. British and Indian units of the 14th Army this week cracked one last desperate stand by Japanese forces on the Tiddim road and drove five miles into Burma towards the Chindwin river. A Jap roadblock established by the retreating enemy one mile north of the Burma frontier was first by-passed, then smashed, with the aid of intensive close air support from RAF planes of the Eastern Air Command. The Japs withdrew, breaking off contact. While one British group was driving down the main Tamu-Sittaung track, other units pushed eastward from the Kabaw valley along a secondary trail to the Chindwin. Indian troops occupied Khauaivum, a mile inside Burma. BULLOCK GETS LEGION OF MERIT Maj. Gen. Dan Sultan, center, awarded Col. Frank Bullock the Legion of Merit. Left, Brig. Gen. William O. Reeder looks on. Flooded rivers and impassable muddy trails held up Allied troops more than the now thoroughly disorganized Japs, who are leaving many dead in their wake. Over 300 enemy dead were counted along one five-mile stretch of road; 200 vehicles, 10 tanks, 12 guns and large amounts of small ammunition have also been abandoned. Contact was made with long-range units which a month ago took to the jungle, by-passing Jap resistance on the main road to harass communications in the enemy rear. Their ambushes since then have killed more than 670 Japs, wounded another 145 and wrecked 60 motor vehicles. British patrols southeast of Ukhrul found an enemy cemetery of 40 graves and a hospital where sick and wounded had been abandoned in the Jap rout, as at Tamu. Their skeletons still lay on stretchers. Parties of the fleeing Jap, unarmed and starving, have been trapped by flooded rivers and are wandering in the hills, dodging British patrols. CHINA - Gen. Kao Chi Jen, of the Chinese Fifth Army, was presented the Legion of Merit by Maj. Gen. Claire L. Chennault this week for his "exceptionally meritorious conduct and service in the recapture of Taunggyi, in April, 1942." "As Vice-Commander of the 20th Division," the citation read, "in action at Taunggyi in 1942, Gen. Kao assumed command of his division under extremely difficult conditions when his commander was killed by enemy action. He later fought and led his division through a number of actions from Burma to Yunnan." DO WE CATCH HELL! The boys in the wilds would have you believe this is a typical Delhi Commando, with ribbons down to his belly button. However, in this case, it's Tojo, former Jap premier who is now sitting out the war in the shower room on the retired list. Next week we'll probably get a letter from some tee-ed off G.I., with "Well, he looks as if he belongs on Queensway." Read the story and see what happens to us. Our distinguished editor has temporarily flown the journalistic coop, and is now dismantling 1,000 pounders with a bomb disposal squad by way of mental relaxation. The job of Roundup editor is spiritually akin to that of trying to tiptoe across a German minefield. Only heroes or lunatics need apply. Visualize our boss, clear-eyed and carefree, whistling a gay tune at week's beginning as he opens the mail in search of news from far-off China or the Burma backwoods. "Well," he cries gleefully, "Here's a happy story. Some boys on the Ledo Road have built an ice cream factory. Great stuff. We'll use it." The item is then subjected to the various efforts of a headline butcher and a copy reader with double astigmatism. And on Thurday, when the ponderous presses roll and start spitting wet Roundups, the ice cream story rests on page four between a New Jersey four-alarm fire and the latest Hollywood scandal. For some days thereafter things go along in deceptively routine manner. Then one morning a full mail bag and the heat is on. "Dear sir: You stinker!" screams the first blast. "I have been on the Ledo Road for many a muddy month, battling Japs, germs and gushing torrents, and the only ice cream I've seen was in a dream. What do you want people back home to think we're doing over here . . . "
Ye Ed sadly lays the missive down. He is hurt, touched to the quick, but then he is a man with a very sensitive quick. On to the next letter, Another beef. "Come out from behind that chestful of ribbons, you Queensway Commando, and wise up. Why don't you guys in Delhi get off your padded ... alleged newspaper ... you couldn't print what are guys are saying ... ice cream, Geez! ... Living on C rations so long ... can-opener worn down to a nub." War is hell. The policy-maker turns misty eyes on his staff, now standing around in a sympathetic little ring: "But fellas, we didn't say everybody on the Ledo Road gets ice cream, did we? The distinction unimportant; it has been swallowed up in a wave of wrath at the foaming front. Resolutely he casts aside the subject, takes refuge that evening in a solacing session of stud and draw. Next day, somewhat richer for having filled pairs up to full houses and made flushes with two-card draws, he re-enters the editorial sanctum shining like a Grenadier's boot. The staff greet their leader with leering laughs: "You got all the mail again, chief," chorus the Roundup's happy hacks. They well know the insidious contents of the silent rows of envelopes. Wearily he peels open the first letter, spots the phrase "ice cream" halfway down the page, drops the sheet of paper with a sharp groan. But the next note is a restorative. Copy - a snappy story on some Quartermaster Truck Company, good boys, hard workers, long hours on rough roads - that's the ticket, let's make a friend. Run it. It runs. The fuse burns quietly for two weeks, then "Where did you ever get such a load of tripe?" Why, those GMC jockeys don't malum a carburetor from a corkscrew; they've never been south of Shingbwiyang. Our outfit was in India before they were activated and buddy, we had it rough. Whyinell don't you check your facts and give credit where it's due?"